A very happy birthday post to Wendy Wyman, originator and artist for Repeat Impressions Stamps and The House That Stamps Built Blog. RI Stamps used for this card are #2611-J "LadySlipper" and #1904-I "A Special Wish". I love being on the design team and playing with the fabulous stamps that Wendy creates. Thanks for letting me hang out and play with your awesome stamps, Wendy. I hope your birthday is one of your best birthdays everah! Oh my, she is so lucky to get this gorgeous birthday card from you. It is so lovely, Cheri. So pretty! Love the inked edges - adds just the right touch to your lovely card! 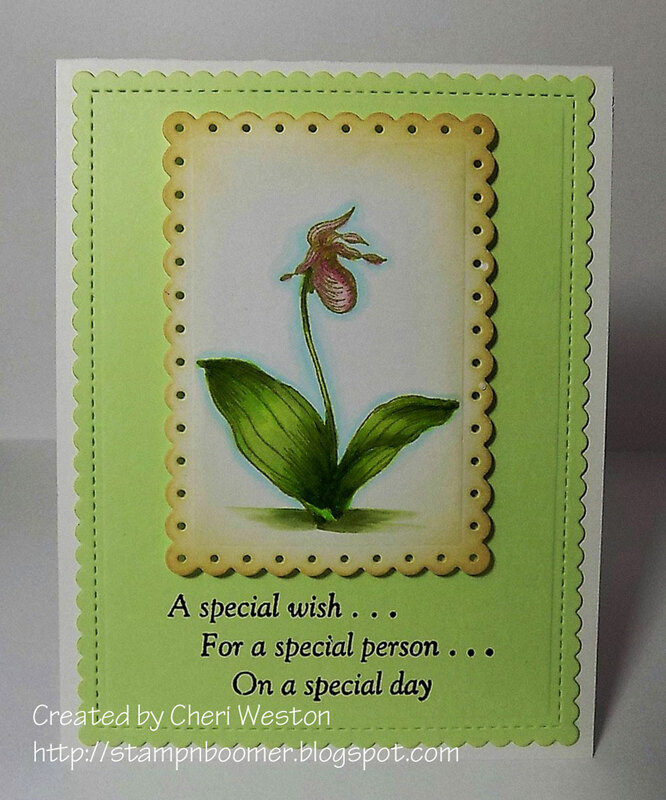 Thank you so much for your kind words and this gorgeous card, Cheri. It is just stunning! I'm so happy that you love being on my team, because I love having you here!! Beeeeeeeeeeeeeeeautiful card SS. Wendy will of course love it as no doubt loves having you part of The Team. Colouring, colours and blending are superb. This card is just darling. Your colouring is absolutely spot on. Those leaves look so real. I like how you sponged colour around the edges. So beautiful!! Gorgeous image and coloring and your scalloped dies are fabulous! This is beautiful and a perfect saying for Wendy!